A blackhead extractor is a skin care implement that removes stubborn blackheads with ease. While extractions are always best left to the specialized hands of a professional esthetician or dermatologist, this tool, when used properly, can help you extract impurities from the surface of your skin safely. Avoid squeezing out blackheads manually with your fingers as this may cause scarring or injury. 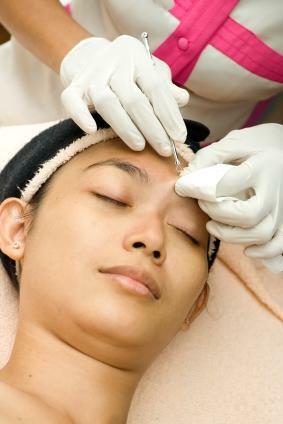 Removing a blackhead may seem like a simple task, but extracting a bump without preparing your skin can be disastrous. Extracting without cleansing first may lead to dangerous bacterial infections and chronic blemish problems. Clean the infected area before attempting to remove the unsightly blemish. Pull your hair back if treating blackheads on your face. Cleanse your skin with an exfoliating cleanser and then rinse with cool or warm water. Pat your skin dry with a soft towel. Working on wet skin may cause your hand to slip and damage your skin, so dry it first. 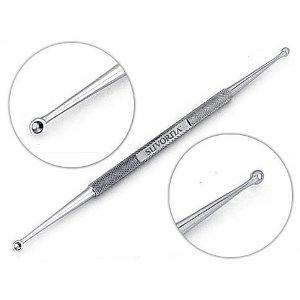 Blackhead extractors are small metal tools with a round opening at one end that professionals and amateurs use to remove oily plugs from the skin. The other end of the extractor features a sharp lancet that helps pierce whiteheads and extract their debris before they form into a blackhead. These extractors make useful tools for removing bumps in your ears or on your nose. Overall, the pain experienced while using an extractor is minimal, but that does not mean the use of this specialized tool comes without risk. Improper use can cause permanent scarring and tearing on the surface of the skin. If you opt for at-home treatment using an extractor, use the tool with great care and never run it across the face in a sweeping motion. Instead, gently remove each individual blackhead using slight pressure. Should pain, swelling or bleeding occur, stop immediately and seek professional treatment. Fill a sink with hot water. Cover your head and lean over the steam for 5 to 10 minutes before treating the blackhead. Soak the extractor tip in rubbing alcohol for at least 30 seconds before using it. This kills dangerous bacteria. If the extractor has two loops, then soak them both before using them. Examine your extractor loops and use the loop with the appropriate size. The loop size should be close to the size of the blackhead. Using a loop that is too large prevents you from getting enough leverage to pop the plug out of the skin. Center the loop over the blackhead. Press straight down on to the skin using the extractor tip. Wipe away the extracted bump with a cotton swab tip moistened in antiseptic. Cleanse the area afterwards with an astringent to sterilize and tighten the pores. After you remove the blackhead, you may notice the pore has become large and open. In order to prevent a recurrence of blackheads, you must cleanse the skin after extractions. Dab a cotton ball with an astringent or toner. Blot the empty pore with the cotton ball. This sterilizes the pore and shrinks it. Apply an oil-free moisturizer to the area to keep the skin supple. Remove blackheads easier by preparing your skin and using extraction tools properly. Medically referred to as comedones, blackheads are accumulated dirt and oil that become locked in the sebaceous glands, producing a pustule that is usually black, brown or dark yellow in coloring. Blackheads are a form of acne and may require professional treatment if at-home care does not help them clear up on their own. Suitable treatments for blackheads are cleansers that contain a mild exfoliant to help remove the embedded dirt and oils that clog pores. In addition to a specialized cleanser, acne-prone skin should be exfoliated once per week to remove dead skin cells and help resurface the complexion. An exfoliant containing an alpha-hydroxy acid is the best for treating problem skin. Prevent breakouts by practicing good skin hygiene, but for those times when a stubborn blackhead just wants to stay put, it may be time to seek treatment from a dermatologist or facialist. He or she will most likely use a blackhead extractor to expel the embedded dirt, oil and dead skin cells.